With GDC week comes a week of announcements and rumors - and it seems like gamers may want to break out their Sackboy plushies sooner rather than later. It's GDC week, everybody! The week of some of gaming's biggest reveals, not counting E3 week! So, let's get things started: A source close to Sony told VG247 that the publisher was set on releasing something called "LBP2" this year. Considering that Sony officially bought LittleBigPlanet developers Media Molecule last week, it doesn't take a genius to figure out that this rumored "LBP2" would probably stand for *gasp* LittleBigPlanet2. Now, this is just an unconfirmed rumor from a nameless source, but if true, we might hear something about it from Sony this week. Furthermore, if true a full, disc-based sequel would signal a change in direction from the Surrey, England-based studio, who previously had stated that its intention was to support the first game via DLC. On the other hand, LittleBigPlanet was flippin' fantastic, Sackboy is adorable, and are you really going to turn down another set of brilliantly designed levels and some new goodies with which to make your own? Yeah, I didn't think so. 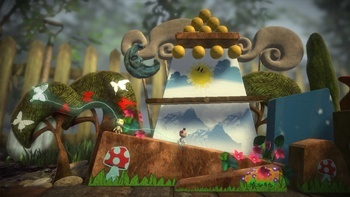 Last week, it was announced that there had been more than 2 million user-made levels created for the platformer. Would a sequel mean another 2 million?